Review: If you are looking for a book to get you biting your nails and laughing your pants off at the same time, then this is the book for you. 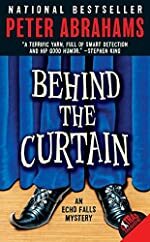 This superb novel, Behind the Curtain, written by Peter Abrahams is an excellent read. This is the second book in the series of the top-notch Echo Falls novels. This story starts out with the main character, Ingrid Levin-Hill, in math class. She is not paying attention in math class so she is picked for Math Fest. Math Fest is a math competition held at the High School and viewers come to watch. Ingrid’s least favorite class is math. One day when she gets home her brother Ty wants her to spot him for his bench press. Ingrid notices that Ty is benching a lot more than he usually does. When he stands up she sees numerous amounts of acne on his back. Ty has always been an acne-free kid. The next morning Ingrid hears that this new woman from New York named Julia LeCain has come to fill the position of Ingrid’s dad’s job. On the morning of Math Fest Ingrid wakes up thirteen minutes before it starts. She has to rush in order to get there in time. While Ingrid is on her bike … darkness. She sees nothing and she is in a very small space. She is in the trunk of a car! Her hands and feet and mouth are duct taped. She feels around for an unlocking mechanism. Then … click she can fell the air rushing on her face. She feels the urge to jump; when the car slows for a turn … she jumps. She rolls down a hill and into a gully. When she finally arrives at math fest, it is over. She tells the police chief and they try to find some evidence to prove that she was kidnapped. After a while Ingrid goes to the hospital to visit her soccer coach, who is sick, and she sees a door slightly ajar. She walks in and finds some steroids in a bottle in a locked cabinet. She finally connects all of these things together and figures out the whole plan. Will the evidence be enough to solve the two cases, or will people just think that she is crazy? This novel was just as good, if not better than the first novel. This divine second crime novel is a great read if you’re having a bad day or you need some action look no further. This book is filled with all kinds of twisty-turvey scenes and intelligent happenings. I really like the way the author made the scenes so that you could figure out the crime before she does. I would recommend the book to ages 12 to adult. The content in the book is a little to mature for the ages younger than the ones listed. There is some violence and some cursing, but overall the book is phenomenal. I cannot wait until the next one is released. Review written by Kevin, Grade 6. Date of review: February 2009.